You just set up your campsite. The tents are up, the sleeping bags are rolled out and the charcoal for your fire just turned that recognizable shade of white, letting you know that you can start grilling. Gathering your group up, you let them know that steaks and hot dogs will be ready soon. After a days worth of driving you are looking forward to relaxing with a cold drink and a nice steak. You go to open your cooler and you notice that all of the ice has melted. You reach in and find that not only is the ice melted, but none of the contents are cold. In fact they are warm to the touch and you more than likely need to throw out those steaks. What are you going to do for the next few days? The food was supposed to last you the duration of the trip. Wish you could have avoided this scenario? It would have been possible, IF you bought the best camping cooler to begin with. What Makes A Cooler The Best Cooler for Camping? What’s the best cooler for camping? If you just needed an ice chest for a few hours to attend a party, then really any good cooler would do. The ice would naturally take time to melt, which would mean that any cooler with a lid would keep things cold. Ice Retention – You are going to be gone for several days. Unless you will be hunting or fishing on this trip, then you’ll need food, and a cooler to keep it and some beverages cold. In fact, even if you will be hunting or fishing you’ll still need food, just in case your equipment breaks or you can’t catch anything. A well insulated cooler that can hold its contents cold for days at a time is what you’ll need. 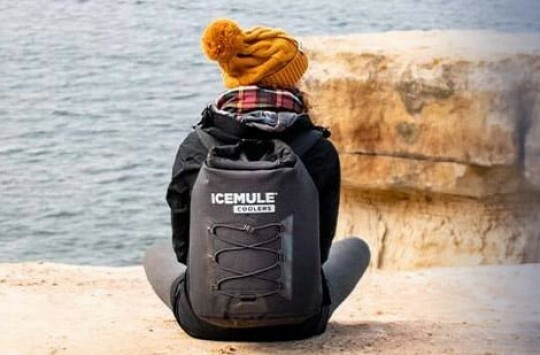 Durability – If your camping trip will take you into rough terrain, in a boat or kayak, then you’ll need to be sure that your cooler can stand the trip as well. Flimsy handles and lids just won’t do. Solid handles and build will be a major consideration as you make your decision. 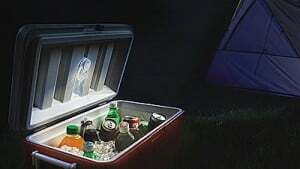 Protect-ability / Lock-ability – If there will be others camping in your area or even possibly bears, then you’ll want a cooler that you can secure. A cooler that allows you the capability to lock it, will ensure that your food and drinks are protected from any and all predators, human and otherwise. There are a lot of camping coolers out there. Some you can pick up at your local store or sporting goods shop. However, if you are looking for the best cooler for camping at a good price, then you may want to go online. With a name like coolest cooler, you know that it had better have some cool features other than soft grips and a built in bottle opener. Coming in a classic orange, green or blue color, this camping ice chest comes complete with a built-in blender that can crush ice. It is also outfitted with a blue-tooth outdoor speaker for hours of music. You’ll also find a built in USB charger, LED light and bottle opener making it the complete companion at your next picnic. At 55 quarts, you’ll find tons of storage space. While there are some pretty neat features that come with this cooler, there is a give and take. One of these mentioned from several users is the weight. When you have the cooler full, it does become rather heavy. Though this is to be expected because of all the extra features. To help combat this though, the Coolest Cooler comes with wheels and a telescopic handle. While it’s probably not be the best camping cooler when it comes to ice retention, this smart gadget-packed ice chest is literally the coolest cooler the world has ever seen. This is the best cooler for camping according to many users we’ve talked to. The Maxcold comes in a 40, 50 and 60-Quart variety. It also features riser technology to ensure that there is little contact with the ground when rolling, which is very appealing for those who are always on the go with their cooler. The durable wheels found on this cooler make it easy to transport and move. The name Maxcold is for a reason as it has extra insulation to keep contents as cold as possible. Many users have mentioned the great amounts of time that contents remain ice cold. One user mentioned three days while another mentioned five days. Either way, several days is a lot of time to have contents remain ice cold, especially if you are camping. Another user also mentioned the convenience of transporting it as the wheels are solidly built and the telescopic handle on the rear of the cooler make it a breeze to roll. The user even mentioned that it reminded them of the handles and wheels on a suitcase. Another pretender to the “best camping cooler” crown is Igloo Yukon. If you are a fisherman looking for a cooler that can withstand rugged fishing trips, one that can hold your catches cold, that travels conveniently and includes an integrated fish keeper scale measuring tool, then congratulations, you just found the perfect cooler. The Igloo Yukon Cold Locker may just be the best camp cooler for the avid fisherman. Dual lid locks ensure that you can keep others out, and a size range of 50 to 150 quarts means you’ll always have more than enough room. The durability and build of these coolers make it a favorite amongst outdoorsmen. One user raved about the build so much so, saying that it has been in the back of a pickup truck, getting regular use for nearly a year and nothing is warped or broken down. Another user mentioned the tremendous ice retention time. While the testing the user mentioned was unscientific, they mentioned putting ice in and checking in on it at a regular basis. Twenty days later, there was still a layer of ice left. That’s nearly three weeks! People and other campers can be a cause of concern when you are camping, as they may get into your food and drinks while you are at your campsite. However, there is a greater concern. Not only can some of these individuals get to your supplies, but they can be hazardous to your health. 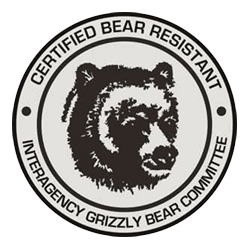 If you need a cooler that is certified by the Interagency Grizzly Bear Committee (IGBC), then have a look in this next section as all the coolers below have been IGBC approved. And yes, there is a Grizzly Bear Committee. Pelican is our pick for a bear proof cooler. It comes in a variety of colors such as pink, tan, orange, maroon and more. Complete with a freezer grade gasket, the ice retention on this cooler comes in at a week or more. Now comes the information you really wanted to know. In a field test with an actual grizzly bear, the Pelican took a beating, but wasn’t beat. The Grizzly bear stood on it, clawed at it, rolled it around and did as much as it could, but still couldn’t get the cooler to break or even open up. There’s not too much to gripe about when it comes to this cooler. Solidly built, durable and cheaper than some of the others on the market, the only really issue that users have had with this is its weight. However, when you are talking about a cooler that is going up against a bear, we don’t think you’d want something lightweight. 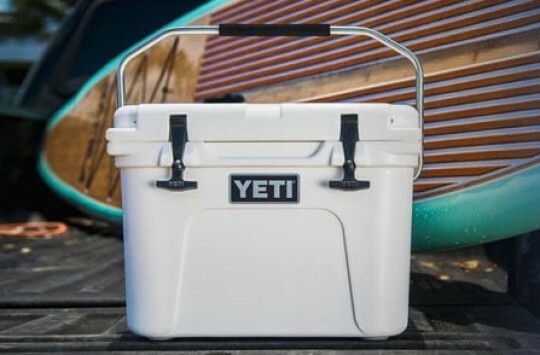 Another Bear Proof cooler is Yeti. The Tundra model can be found in sizes ranging from 20 to 65 quarts. The T-Rex lid latches keep it extremely secure, even from Grizzly Bears. The ColdLock gasket keeps much of the unwanted warm air out so your food and beverages can stay cold longer. So just how did the bear do against this cooler? No match for the Yeti Tundra. While there was some cosmetic damage that was visible, the grizzly bear was unable to get the yeti Tundra open. Though it tried, clawed and rolled the cooler, it couldn’t get in. While the build of the Yeti Tundra frustrated a Grizzly Bear, they won’t leave you feeling that way. One user mentioned getting tired of other coolers’ latches and hinges breaking, that they purchased one of these and never looked back. The user reported getting rid of all other coolers once this was purchased and used. For more information check out our Yeti coolers on sale post or check out this Amazon page for all information and the latest price. These bear proof coolers come in a variety of sizes and colors. The walls are two inches thick, and built in hand grips make it easier to carry. There is rope used on this cooler, but one user mentioned that it is the type of rope that can be easily replaced should something happen to it. This is good to know as you won’t have to send it back in for such a fix. Would this finally be the cooler that a Grizzly bear could destroy? After much standing, pushing and clawing at the Engel, the Grizzly bear simply couldn’t demolish it. Another reason why this has passed the test. One user mentioned that the textured lid made it ideal for standing on when fishing. Another user reported that they took an Engel and another cooler out for six days. At the end of the trip the Engel DeepBlue coolers still had ice, while the other coolers were no good. Best Camping Cooler – What Now? There are many coolers to choose from, but your needs will vary from location to location. Some things to think about are durability, possibility of predators such as bears getting to it and transportability. Once you can figure out what your specific needs are, we are sure you’ll be able to find the best camping cooler for your specific needs and wants here. 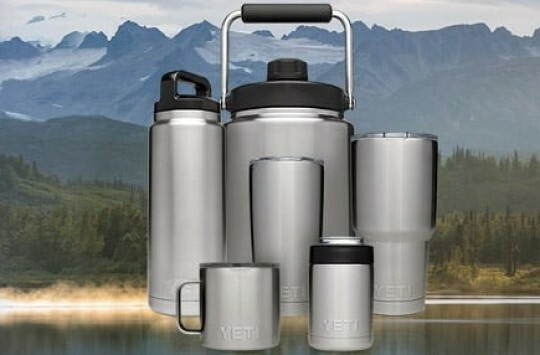 Best Camping Coolers – Check Our Recommendations!